How to identify threads with new replies? I'm still trying to get to grips with the new interface -- how can I tell, in each forum's listing, whether a thread has had new replies since I last checked? Are you using the "unread" tab at the top of the page? The colour of the thread's hyperlink is slightly different - for the theme I'm using, it's black if I've read all the posts on the thread and nearly indistinguishable blue if I haven't. @Godder Wow thanks, I didn't notice the color change at all (or that I could change the theme). I haven't found a theme with a huge difference in color but "readable" at least is noticeable for me. I kind of just wanted to pipe up and thought this thread might be the best place. After a couple of months of the new TMD, I'm generally finding myself using it much less than the old forum and feeling less engaged by it - and, a lot of that has to do with the way the information here is now presented. Hats off to Brassman for putting his time and energy into it, but I feel like far more of what is being posted is passing me by than on the previous site. Readability remains a big issue - I mean, the colour difference you've mentioned above for read/unread thread's is all but indistinguishable and required trawling through various themes until I could find one where it was even noticeable. Then generally, it's so much harder to get an at-a-glance feel for what threads are active - because of the general lack of hierarchy on the site: both on the landing page (where before topics where broken down into easily visible sub-fora, bolded for new posts - now you only see activity from one thread, have no idea which thread or if its relevant to your interests), and within the forum categories themselves. I think in a couple of forums it's particularly problematic: First, in the strategy forum - deck discussion mixed in with general strategy chat and card discussions means it's hard to parse the forum at a glance to find what you need. 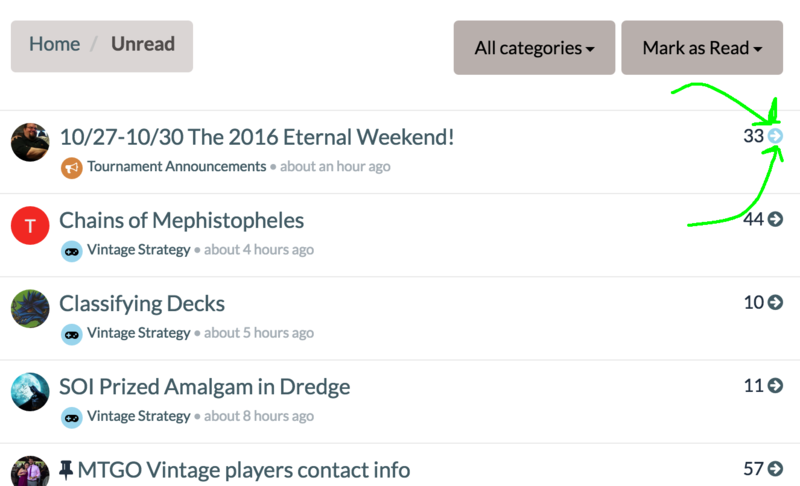 As a quick fix, maybe we need stickies for current "decks to beat", just so there's some sort of constancy, a snapshot at the top of the state of the metagame, where to talk about it and which decks within that are currently generating discussion. I feel this would aid readability some - even if graphically, the fora still desperately need more visual hierachy. Secondly, I think the tournament forum also suffers quite badly from this. It took me a while to realise that the TO's reports were separate from individual tournament reports - and given lack of discussion on most individual tournament reports, I suspect I'm not the only one over looking them. Then within the official TO results forum, the same lack of visual hierarchy on other pages, means its generally hard to tell what the most recent tournament is - perhaps a new tournament result gets stickied/highlighted a different colour for a week? Sorry to be a bit negative if you're reading Brassman - I'm sure you've put a lot of effort into the site, for which I am very grateful. It's just that after letting the change settle down for a couple of months, I'm really noticing that it's effecting how engaged I am with the site and that's regretful to me as I've always turned to TMD as my first port of call for Magic matters. Keep up the good work. I can't figure out what is read and unread. I'm less interested in clicking every thread to see if it has a skip to unread pop up. Save me brassy. PS, I'm on chome mobile most of the time. Annnnnd I just figured out you can swipe right and there is an unread threads button. Sigh, this is why I don't like minimalist/responsive designs. Yes it's less cluttered, but I had no idea that whole menu was there. @sodoyouwearacape @nataz I'm a little confused, is the "unread threads" link not solving this issue for you? there should be a icon/link at the top of the page with a number indicating how many threads are unread since the last time you logged in. On mobile the link is inside the hamburger menu on the upper right. The link should take you to http://themanadrain.com/unread , which lists all threads you haven't read since your last login (you can disable those notifications on a per-board basis) ... I basically use that as my home page for the site. If that page isn't solving your problems, I probably don't understand what the issue is? so please elaborate! specifically @sodoyouwearacape - don't worry, I don't mind the post at all. I absolutely want people to keep complaining about meta-site stuff if it's not helping them get around. Unfortunately I've been swamped with some non-TMD stuff lately so I haven't been able to spend the time I've wanted to on the site itself (and some of the things I've tried to work on have taken more effort than anticipated - fixing the archive site being the worst), but I know there's room for improvement and I'm hoping to keep that up. It's been found! I'm just slow. Problem solved for me. Also, thanks for almost the hard work on the site. @Brass-Man Hi Andy, thanks for taking the time to respond - so far, I've not really used the Unread Threads page , as just seeing the big number of items I would need to trawl through turns me off (as opposed to the old site - knowing I could cherry pick more easily, between say activity in the Blue-Based Control forum and Dredge or whatever). But - if you reckon it's a good solution, I shall give it a try from here on in and see if it improves the usability. Again, thanks for all your efforts on the site. And good luck in the (now on again) VSL! Has there been a way to permanently block (I use this term loosely) threads from appearing on the "unread page?" For instance, the thread about "How to use Lion's eye diamond on MTGO." I think this is a very beneficial thread, but not one that I have interest in seeing updates on as it doesn't apply to me. Is there any easy way to block it from ever showing up again (in my unread page)? Same for Tournament announcements that don't apply? I think I mentioned this before, but would love to see some sort of icon or x in a box next to the thread that I can click to block. Maybe a pop up to make sure "are you sure you don't want to receive updates on is thread," and then once I click that, the thread will never appear again on my unread page (but is still viewable if I click into specific categories). For those of us that are anally compelled to always have a clean slate, clicking through subjects I have no interest in, just to clear the unread page, can be an annoyance. Not a huge issue now, but as traffic grows, having an overwhelming unread page might keep users away. Having updates for threads I like, or new ones be the only things that show up on the unread page would be divine. I think all of this manipulation should be able to be done on the unread page, quickly. And not inside each individual thread. @joshuabrooks unfortunately right now there's no way to do that on a per-thread basis. You can block an entire subforum (the "ignore" button on the upper right of a subforum page), but I know that doesn't solve your particular problem. A few people have asked for a per-thread ignore feature, so hopefully I can find something that works for people. Awesome, thank you! I think this would be a really beneficial addition to the site, and make checking in (love the unread page) a little less overwhelming/tedious. Is there a way to leap to the part of a thread I haven't read before? In the Olden Days, when I clicked on the little ``new'' icon near a thread title, it would warp me right into the new content within the thread. Is there a way to do that here? When I look at the unread posts page, it shows icons but not screen names for who started each new topic. Is there a way to display who started each thread? I know I could take the time to hover over each icon and see whom it represents after waiting a bit. But, we humans are short-lived creatures and life is too brief for a one-by-one sequential hover. I think there should be some identifier showing which thread you are suddenly in if you click one of the new posts in the right column on the homepage. Now you jump straight to the post without knowing in which thread you end up. When you first go to a page there is a button that comes up on the bottom right that takes you the last unread page. Barring that in the upper menu near the middle is a bar with a number above it (right now this thread is 15 out of 16. If you click the up and down arrows you can jump anywhere in the thread you wish to go. You'd have to know your last known thread but you can at least get close with this tool. Is there a single button that will get me there, as there was on the old website? I'm not sure trying to catch a sudden 'pop-up' window is a great idea. And I often have absolutely no idea where I last was in the thread, so I can't effectively use the up-top buttons to navigate to my last known location. I don't know if there's a solution to your exact use-case, but there is a way to jump right to the most recent post. That takes you to the most recent post in a thread that includes unread posts. If it's a very long thread and you haven't checked in for a while, you might still have trouble finding where you left off, but it should be an improvement for the general case.